Baen Ebooks sells DRM-free Ebooks in seven downloadable formats. We sell over 1,000 science fiction and fantasy Ebooks and feature over 250 authors published by 11 different publishing companies. We add at least four new Ebooks every month! What is Baen Ebooks' DRM policy? All of Baen's Ebooks available on its Baen Ebookstore are DRM-free and available worldwide. Once you purchase one of our Ebooks, you can download it as many times as you would like, in as many of the seven formats we provide, for as many Ereaders as you'd like. What payment methods does Baen Ebooks accept? • Is the card expired? • Is your total more than your gift card? • Is your card registered? Contact the gift card's issuer to register your name, address, and phone number affiliated with the billing address on your Baen Ebooks account so our fraud prevention software does not decline the transaction. You can register your card using the number provided in your card's documentation or by visiting their Web site. Unfortunately, our fraud prevention software does decline some gift cards even if you have done everything correctly. It's the downside to keeping our customers protected. If this happens, please use another payment method to complete your Baen Ebooks order. What is MicroPay? How does it work? What is a Baen Ebooks Gift Card? Baen Gift Cards are digital gift certificates that can be used to purchase any Ebook in our library. How can I purchase a Baen Ebooks Gift Card? 1. Visit our Gift Card section by clicking "Gift Cards" under the yellow categories section on the left-hand navigation menu. 2. Click on the image of the Gift Card or the "More Information" button. 3. Select the pre-loaded amount you wish to order and the quantity. 4. Click "Add to Cart" to place the Gift Card in your Shopping Cart. 6. You will be asked for your Recipient's Name, Recipient's Email Address, and to include a brief message for your gift recipient. 7. After filling out the Gift Card Email form, complete the ordering process as normal. Your Gift Card Recipient will receive the Gift Card via email. How do I redeem a Baen Ebooks Gift Card? 1. Select an Ebook you'd like to purchase and place it in your Shopping Cart. 2. Click "Shopping Cart" under your name at the top of your screen. 3. Scroll down underneath the books in your cart and you'll see a section (in bold yellow letters) called "Coupon or Gift Card." In the box, enter the alphanumeric claim code the gift certificate came with. 4. Select "Update Cart." The remaining total should reflect the Ebook purchase amount minus the Gift Card balance. 5. Follow the checkout process as normal. Where can I find my Gift Card redemption code? Your Gift Card redemption code is the alphanumeric "claim code" found in the upper right hand corner of the Gift certificate email. When is Baen Ebooks updated with new content? To learn when a book is available in Ebook form, check out Baen's publishing schedule of new and upcoming releases and look for the gold "Ebook" button. Clicking that link will take you directly to the Baen Ebooks' product page. To see a list of current and previous releases, head over to Baen's publishing schedule and click on the "click to see Current Releases" button at the top. At this time the Schlock Mercenary Bundle and the individual titles that comprise it are the only Ebooks we provide in PDF format. We've extensively considered PDF format for Baen Ebooks. However, Baen Ebooks does not currently plan to offer it for collections other than the Schlock Mercenary comics. 1. Click the "Your Account" link below your name at the top of the screen. You'll be taken to your account page. 2. Click the blue "View Your Order/Billing History" link or scroll down to see your order history. 3. You can download your books individually or grouped by orders. 1. Click the "My Books" link on the left side of the page under the Categories section. 2. Click the cover image, the title, or the "Download" link for purchased Ebook you'd like to download. You'll be taken to the product page where you will find a list of download links. You can also wait to receive your download link email that accompanies every purchase. In this email you will see a list of the Ebooks you purchased with a direct link to their product pages (under the links to individual books section). Click on the purchased Ebook you'd like to download (either the cover image, the title, or the "Download" link), and you'll be taken to the product page where you will find a list of download links. •You aren't logged in– Verify you're logged into Baen Ebooks.com before you click on a download link in your Download Instructions email. Can't tell if you're logged in? 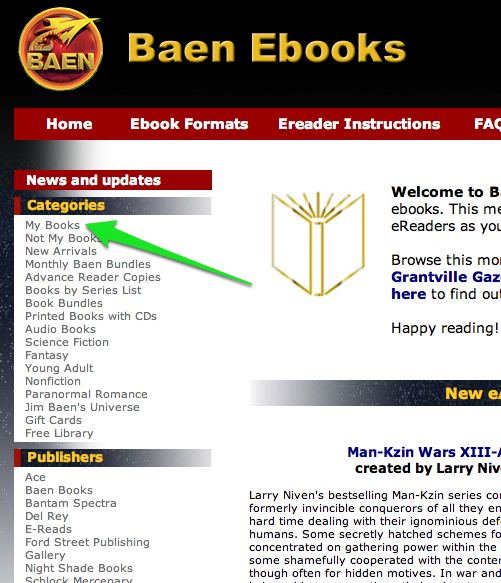 You'll see "Welcome, <your name here>" in yellow text at the top right-hand corner of the Baen Ebooks page if you are successfully logged into our Web site. •You're using an old email– Download Instructions emails sent before our site redesign that contains links with "webscription.net" in the URL may not work. Please log onto the Web site and use your order history or "My Books" link to access your Ebooks. If you download the compressed, zipped version of our Ebooks, make sure you unzip the files before opening or transferring the files to your Ereader. On PCs we recommend WinZip. No program is needed on Macs as the extraction software is built into the OS. The new mass download page makes downloading your books faster and more convenient! Now you can download up to 100 books at a time. The mass download page lets you download multiple books at once in any of the most common formats (Ebookwise/Rocket, Mobi/Palm/Kindle, EPUB/Nook/Stanza, Microsoft Reader, Sony Digital Reader, RTF). You can download any books you have previously purchased, or any books currently available in the free library. Select your desired books on the left hand side of the screen and use the enter key or the arrow button on the screen to transfer them to your download list. Once you’ve made your selection, choose a file format from the file format dropdown list and click Download. Your download will begin. The mass download page allows you to filter your owned books list by author, category, and publisher. You can also search for specific book titles. You must be logged in to use the mass download page. You may only download up to 100 titles at a time. You can’t mass download books in uncommon formats (pdf, mp3, wav, flac). What happens if I try to download a book that doesn’t have my selected format? • A cost savings of at least the price of one Ebook! • Pre-release access to books prior to their mass-market publication! Each novel is published in three segments, one month apart, beginning three months before the actual publication date. Each month, several books are available. For each month purchased, you receive access to a directory containing these books. Four months before publication, the Ebook is listed as Forthcoming. In order to tell how much of an Ebook is currently available in a certain month's bundle, go to the Monthly Baen Bundle page, and underneath each book title in red, you will see either Half or Three-Quarters. No red text means the full version has been posted. You will not need to pay any additional money when the full version is posted. When we repeat Ebooks, it's because those books have been rereleased in print—usually in paperback, a second edition, etc.—so we are also featuring them on our Web site. The $18 price point may not seem like such a deal if there are Ebooks you already own included, however, when considering at least half of the Ebooks are still new to Baen Ebooks, you are still saving the price of one Ebook. As of December 16, 2012, you can only buy monthly bundles prior to their publication date. For example, the March 2013 Monthly Baen Bundle will only be available for purchase until February 15, 2013. Most likely, we only have the eARC text available at this time. The "non-ARC" version is not available to us until roughly a month before publication date. Until we get the final text (then converted and uploaded), we use the text from the ARC for the Sample chapters and Baen Ebook Monthly Bundle quarters. We offer the ARC at a $15 price point because not only are they exactly how the author wrote them, but they are available well in advance of the official publication. Originally, the Grantville Gazettes were numbered using roman numerals, but when Baen Ebooks began printing the best of compilations, the exclusively online volumes shifted from roman numerals to numbers. This naming was not updated with the earlier volumes. I want to purchase some of the Grantville GazetteEbooks, but I already have all of the mass-market paperbacks published to date. At what point do the Ebooks contain material that is exclusively online? The first four paper editions of the Grantville Gazette were simply print versions of the first four issues of the electronic magazine by the same name. Beginning with the fifth paper edition, however, we realized that we couldn't maintain the same system. Starting in May of 2007, the Gazette e-magazine started publishing on a regular bimonthly schedule, and it soon became obvious that Baen Books couldn't possibly keep up with the volume of stories being produced. So, beginning with Grantville Gazette V, the anthologies consist of the best stories selected from half a dozen issues of the magazine. Due to their large file size, the Schlock Mercenary PDFs aren't currently offered as order ZIP files. A traditional "Download Order" link is generated when you order Schlock Mercenary Ebooks from Baen Ebooks, but no download ZIP is created if a non-PDF Ebook was purchased in the order. Please only use the PDF links provided on the individual Ebooks' product pages. I love your Free Library Program! Where can I find more information about it? To download the free Ebooks in our Free Library program, click "Free Library" under the Categories section on the left-hand side of the page. If you've browsed the FAQ and Ereader instruction pages but still need help, email us at baensupport@principledtechnologies.com. So we can easily assist you, please include the email address and name associated with your Baen Ebooks account. Please keep in mind that we can only offer assistance for visitors and customers of Baen.com, Baen Ebooks.com, or the Baen’s Bar. If you have questions about a Baen Ebook purchase you made from another Web site, please contact them directly.